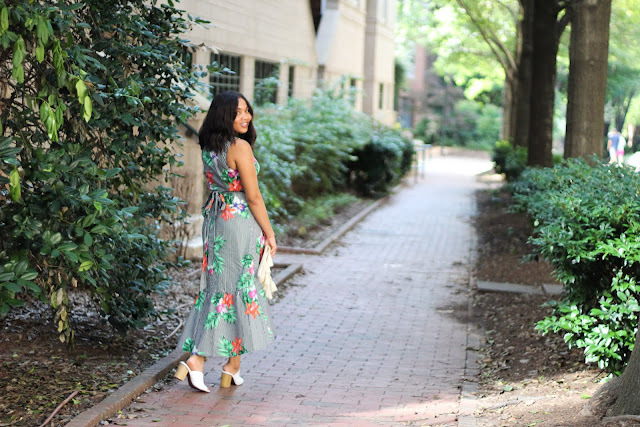 Floral Wrap Midi Dress: Target found here. 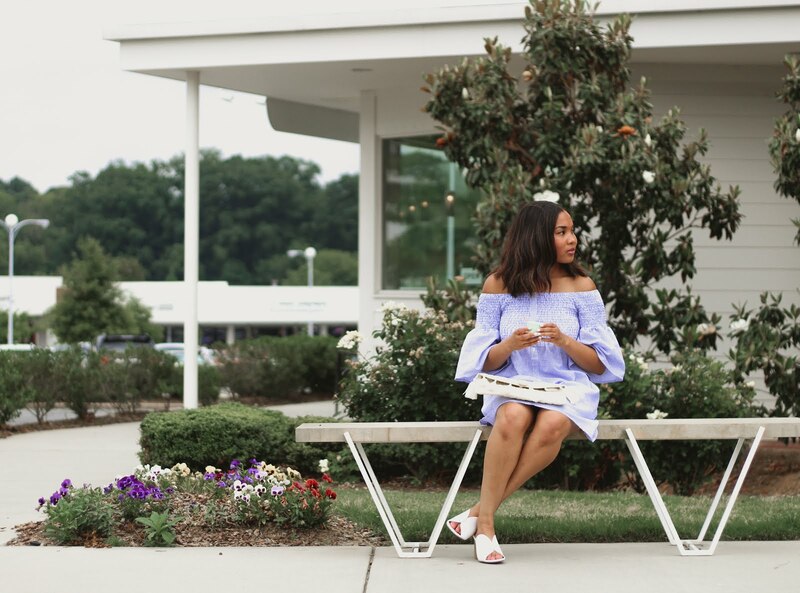 White Mules: Who What Wear Collection via Target found below. Straw Clutch: A New Day Collection via Target found below. 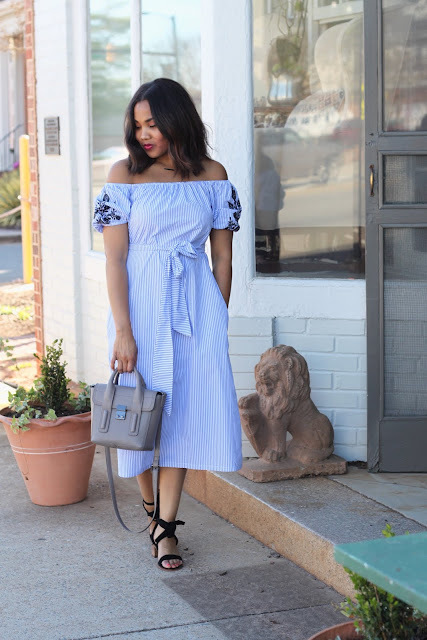 I have been obsessed with Target's Who What Wear Collection since it launched. 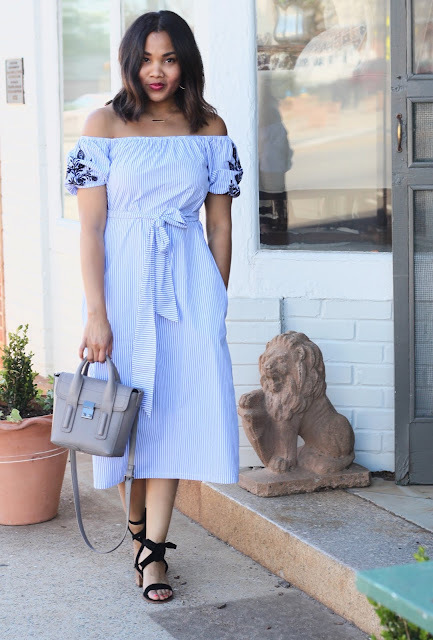 I pop into the Target on the daily just to spy what's new in the collection whether its a handbag, a cute shoe, or a darling dress like the one in today's post. If you have been following me for awhile then you know I jump at any chance I get to mix patterns and just be playful and have fun. 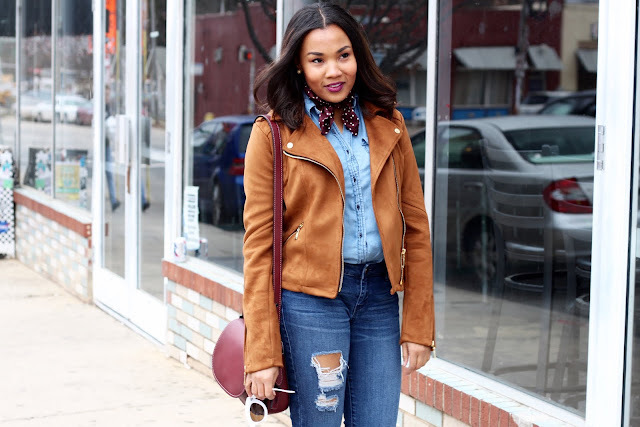 I love that about style- that you don't have to take it so seriously and that every outfit can be unexpected. This midi dress is perfect for summer. I can totally re-wear and dress this up completely with a statement ear and a dressier pair of heels to be wedding ready. I love that about the Who What Wear Collection pieces. They are so versatile and can be worn over multiple seasons and throughout the years. Their pieces are timeless. Today has been somewhat of a strange day of reflection for me. With hearing about the passing of style icon, Kate Spade it made me think about how short life is, and how you just never know what others are going through. Kate Spade was a trailblazer within the fashion realm, having very little knowledge of the handbag business or even the design portion of the business, she kept her head up and pushed through adversity and the challenges which come on the road to success. 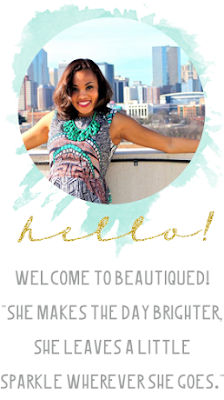 She inspires me to keep going, even though some days I have no idea what I'm doing in this whole world of blogging and all that comes with it. All you need is confidence in the passion which has been placed in your heart, and faith that what you produce actually matters and inspires others. With hearing of how Kate passed, it made me think if she really believed that she mattered and that she was an inspiration to so many. I wish she would have truly known how many lives she touched. Wherever you are, whatever you do in life just know that you matter. You are important. Your presence doesn't go unnoticed, your smile, your creative energy and just YOU alone are like no other. Remember that today. Kate Spade, you will be missed by many. I seriously cannot believe we are already half-way through April and that Easter is THIS Sunday. How crazy that we are almost half-way through the year! Easter, or as I would like to call it...Resurrection Sunday is always such a nostalgic, and traditional time of year for me. 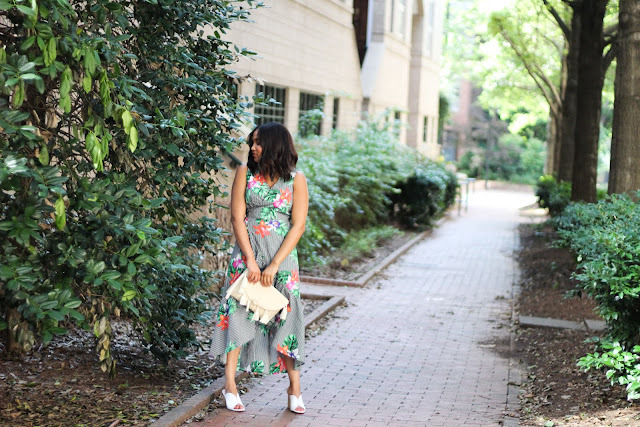 It reminds me of all the countless Easter's as a little girl when I would look forward to picking out the perfect dress, and shoes and deciding on the perfect hairstyle to go with my whole look. I was THAT girl. I guess that's what happens when you are raised in the South, and the Bible Belt at that. It's interesting to look back over the years and observe how much the holiday and its meaning has changed for me personally. As I've grown into an adult, I have adopted my own spiritual life and love for the Lord, so this day isn't so much about finding the perfect outfit, but more of acknowledging God's perfect and relentless love towards me and you. That doesn't mean that I don't get a little excited about buying a new outfit to wear for the day. The holiday has come to be a time of reflection, and all day worshipping my Lord and Savior who loved me, and you so much that he laid down His own life. I also enjoy spending time with my family, cooking, eating and laughing and enjoying one anothers company-just thankful! 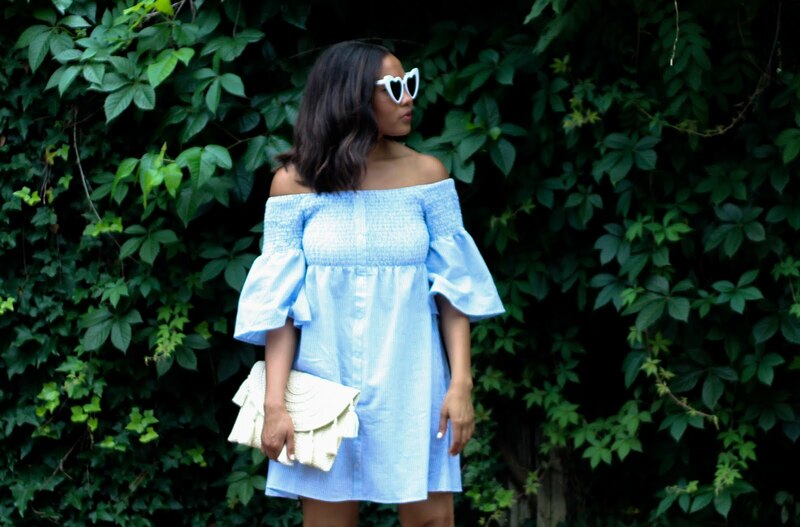 The cold shoulder trend is one that I have expressed my love for before, and I can't stop won't stop! I love this striped and embroidered dress from the Who What Wear Collection at Target. It's perfect for church, brunch or afternoon Sunday Funday activities with the fam. What are your plans for the holiday weekend? 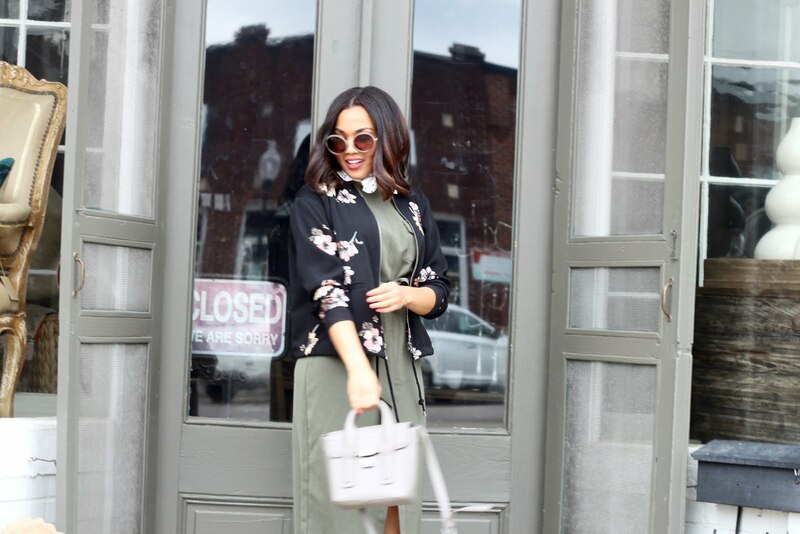 Floral Bomber: Who What Wear via Target. 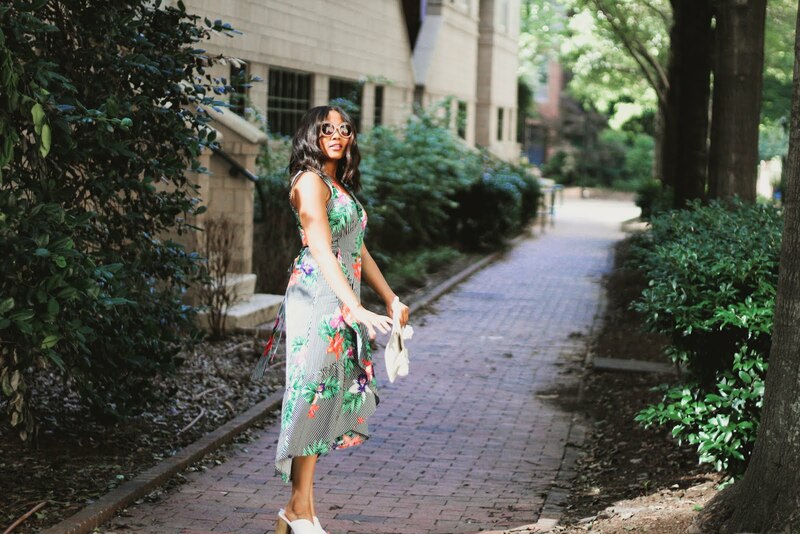 Olive Green Midi Dress: Who What Wear via Target. Gray Minibag: Marshalls. 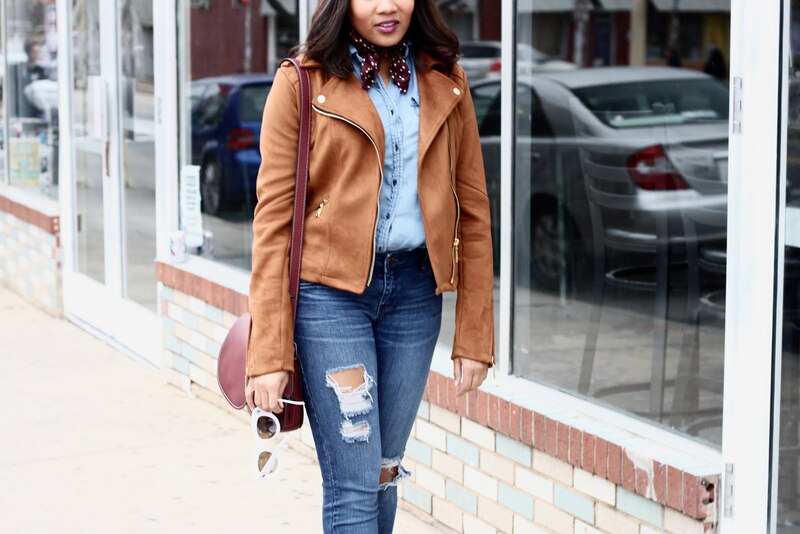 Polka Dot Ascot Scarf: Who What Wear via Target. Round Sunnies: Francescas. Black Bootie with Metallic Heel: Aldo Shoes. I'm coming at you this hump day currently snuggled up in bed fighting what seems to be a mixture of a cold/allergies and the up and down temps certainly aren't helping! But, the silver lining of it all is I've spent the whole day watching Bravo and catching up on sleep. Sometimes, all your body needs is a little dose of R&R. 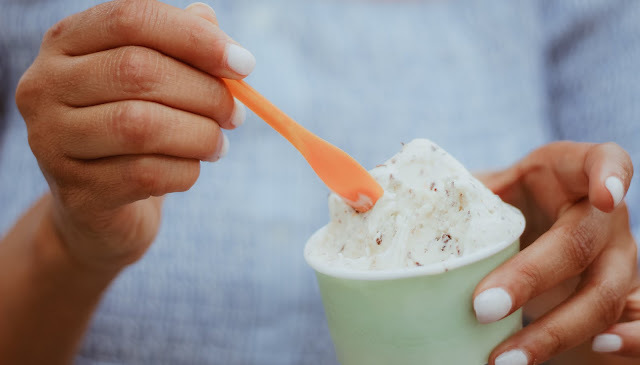 I'm dreaming of warmer days and starting to make my list of Spring must haves. 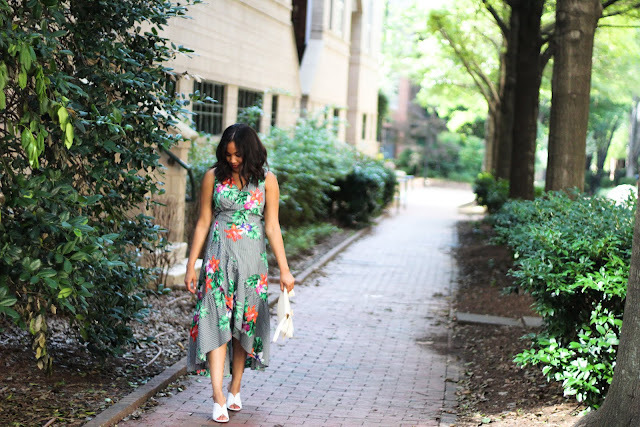 Lots and lots of florals are definitely at the top of my list. 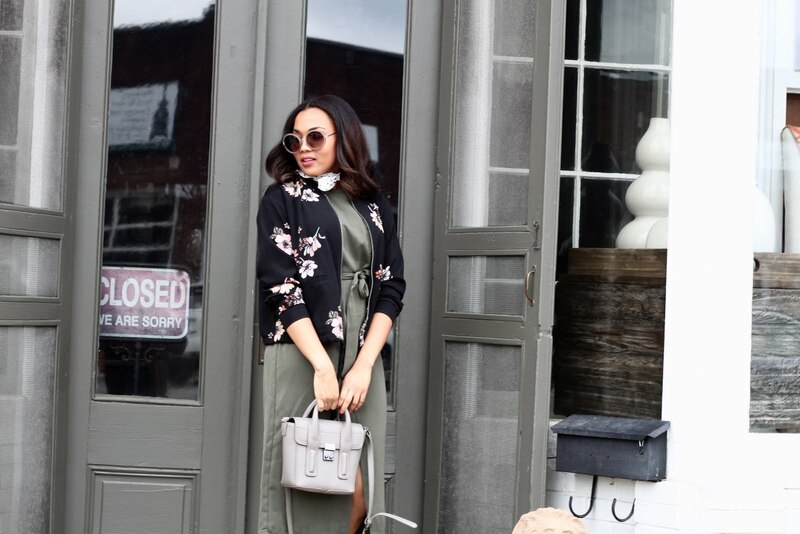 Florals scream Spring, and there is just something about this floral bomber and polka dot ascot combo that gives me a French/European vibe- which fun fact about me, my name is actually French and I was also born in Germany as my dad served in the military. I haven't been back since being born overseas and obviously don't remember a whole lot but this outfit would be perfect for having a fancy latte at a little French bakery. 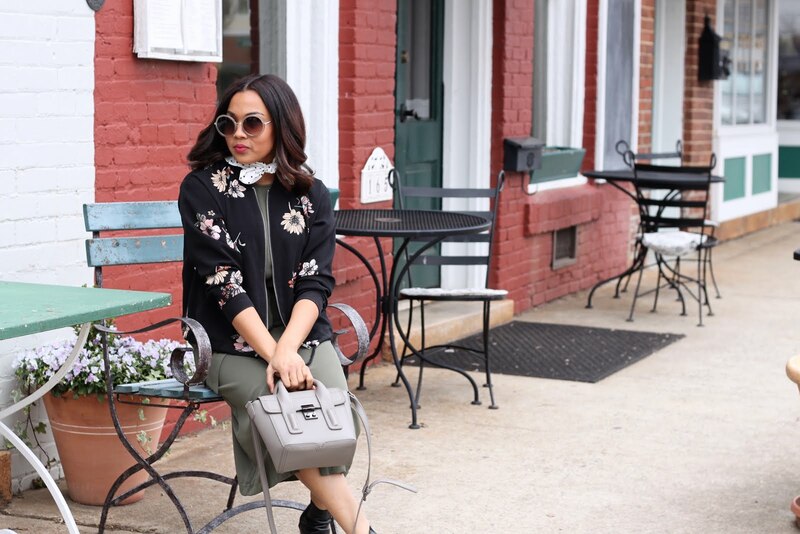 The bomber jacket was a huge trend during the Fall, and continues to remain a statement piece for Spring. It's the perfect, lightweight layer to have in your closet for cold mornings, and warmer evenings. If you are looking for the way to make a statement this Spring its all about florals and embroidery. It's so boho chic! I can't wait to share with you guys the cutest, floral and embroidered mules I just scored from Belk. 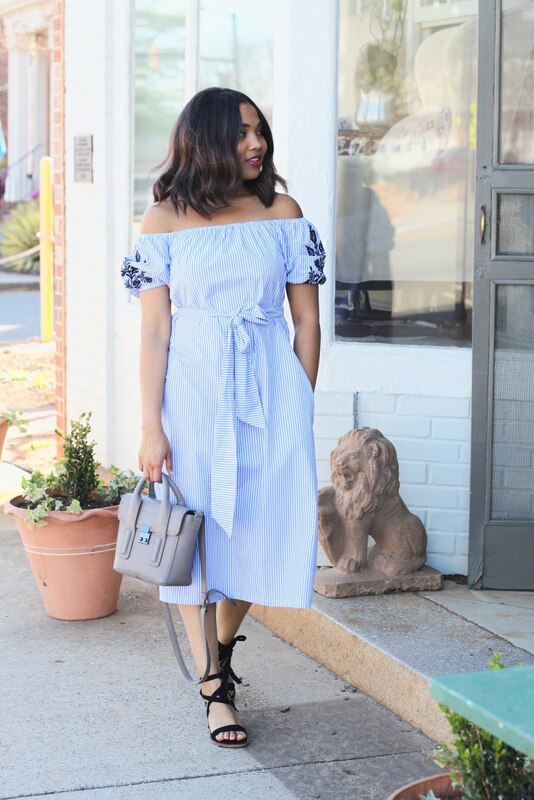 What trends are you most excited for, for Spring? 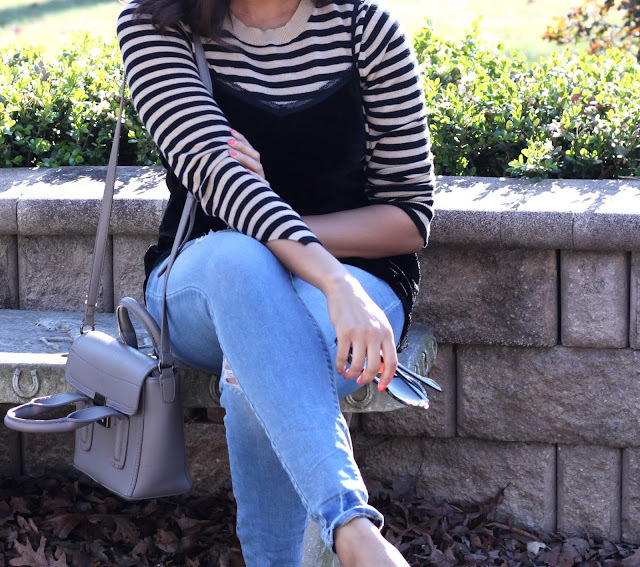 Striped Top: Who What Wear via Target. 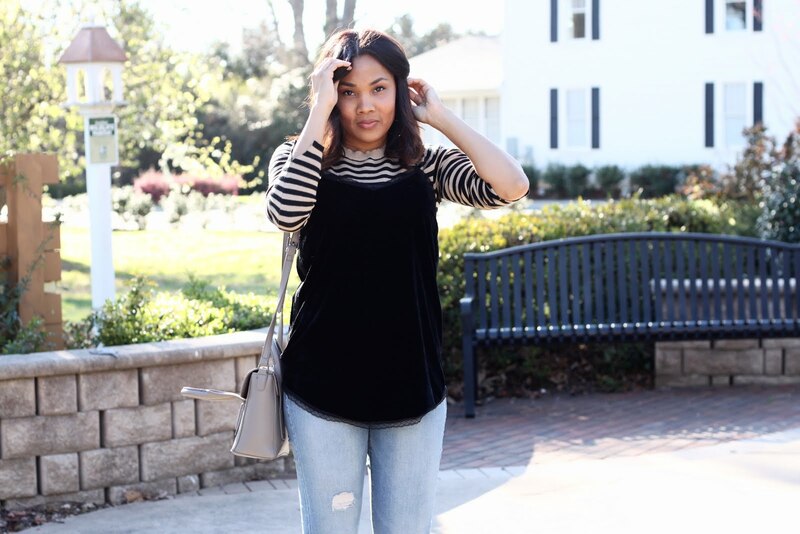 Velvet Spaghetti Strap Top: Who What Wear via Target. 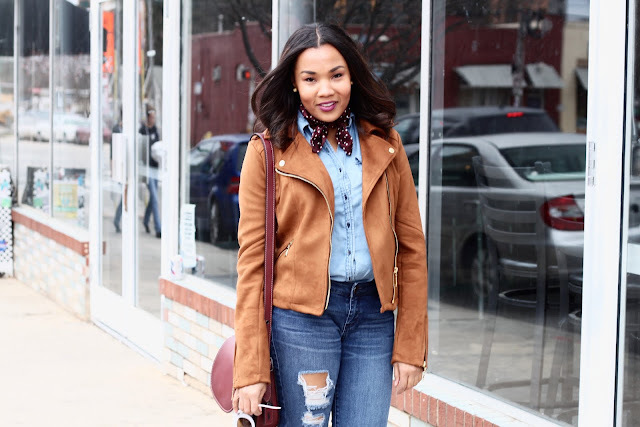 Light Distressed Denim: Marshalls. 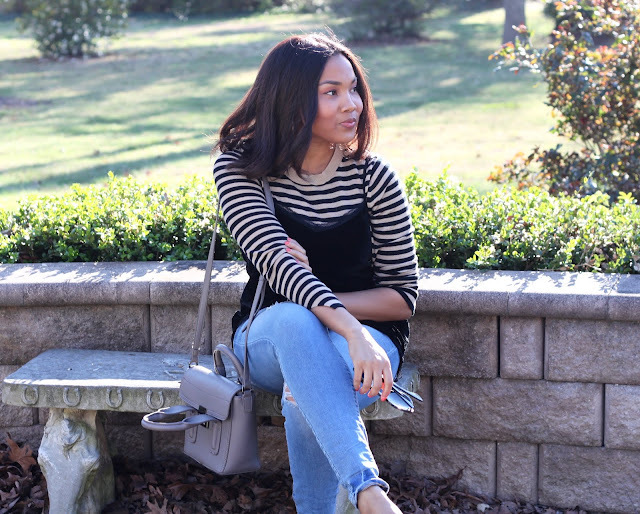 Camel Heels: Steve Madden via Belk. Gray Minibag: Marshalls. Sunnies: Target. Happy Friday, friends! We made it through yet another week. And I'm so grateful! I'm looking forward to some much needed rest and relaxation. Thank the Lord for the invention of weekends. For renewing your mind, body and soul and just being. I don't think I really began to treasure and understand the importance of weekends until recently. I mentioned in a previous post earlier this year, that I was working every Saturday for a local bridal boutique on top of my full-time job in corporate retail to pay off some debt quicker. While I enjoyed helping beautiful brides to be find their perfect gown, the rest my body needed was essential for me to give my all to my full time job and to this little corner of the internet. I'm thankful to the Lord for lessons learned and for provision in my efforts to financially set myself straight. I've been living for the 2 days of the week that I get to myself. When I get to decide if I want to wake up early for cycling, or just sleep in or if I want to spend the night drinking wine and laughing with friends. So, cheers to the weekend! What are some of your favorite weekend leisure activities?